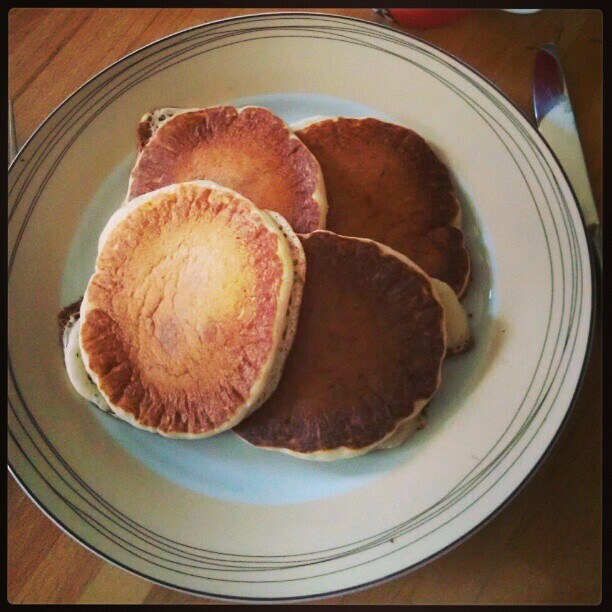 Today is Pancake Day in Britian (also known as Shrove Tuesday, Fat Tuesday or Mardi Gras in other parts of the world). Even though I am not at all religious, this is one religious day I can get on board with–even if it is only to stuff my face with pancake goodness. Pancakes are associated with the day preceding Lent because they were a way to use up rich foods such as eggs, milk, and sugar, before the fasting season of the 40 days of Lent. The liturgical fasting emphasized eating plainer food and refraining from food that would give pleasure: in many cultures, this means no meat, dairy, or eggs. Pancake Day is a big deal. It’s the only time of year pancake mixes on prominent display, and the various pancake toppings seem to be available. And in Britain, there is surprisingly a lot of choice! First, American or British-style? If American style, are you doing buttermilk, fruity, or pancakes with bits of bacon? How are you topping them? With maple syrup, honey, or fruit? If choosing British-style, do you go with the traditional lemon juice and sugar, Nutella, golden syrup or something savory? In my household, we’re going American-style buttermilk pancakes with maple syrup (which is Canadian–how multicultural of us, right? ), and completely from scratch–the Better Homes and Gardens New Cook Book has an easy and tasty recipe. Tell me, how do you like your pancakes?